Diapering doesn’t have to be scary. Ready yourself with these diapering tips for babies, crawlers, and toddlers. From a mother of four who has had a lot of experience with changing messy bums! Have you ever seen the viral videos of Dads changing their baby’s diaper with fear in their eyes as they tackle the battle of diaper changing? I have watched a few and they almost always leave me in a fit of giggles and tears because I have been there. 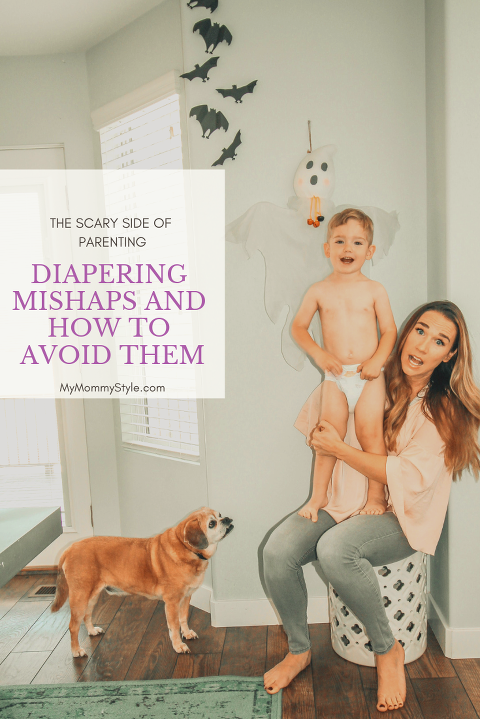 Diapering mishaps happen and I am going to share a few of my best tips of what to do when scary strikes. Always have plenty of diapers and wipes. Consider stocking up your car, your house, your friend’s house, your parent’s house with supplies/diapers/clothes. Use diapers that are made for newborns like new Pampers Swaddlers that are 2x softer and have Air Channels™ to allow air to reach baby’s skin to help keep them dry and comfortable. They also have a special umbilical cord notch. Have your new diaper open and ready when you are about to change your baby. It is a good idea to keep your baby “shielded” before removing everything. Use the diaper itself to wipe up the mess as much as possible. This will save on the mess and the amount of wipes you will have to use. Be prepped for the next size up. Babies progress from newborn to size 1 quickly and even more quickly to size 2. If diapers are too small for your baby blowouts are much more likely to happen. Buy a pee pee tee-pee. This isn’t necessary, but I’ve heard it can be super helpful with baby boys. Bring two outfits…you just never know. When my babies are small I will typically layer their clothes with a basic onesie underneath. This helps protect their clothes and has saved me many times when an unexpected blowout has occurred. Stocking up on diapers when they are on sale is a great way to save money and plan for future sizes. 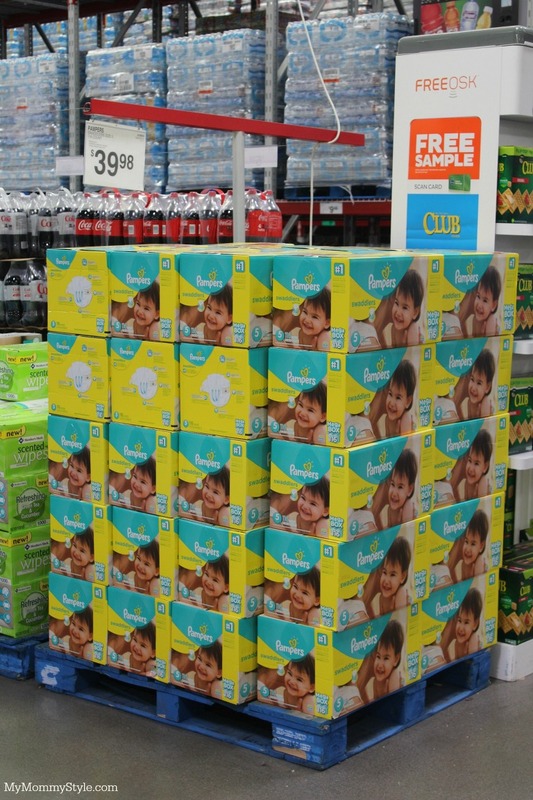 Now through November 25th, Sam’s Club members can get $3 off each box of Pampers diapers and Pampers wipes at Sam’s Club and on samsclub.com. With free shipping, all you have to do is shop online or on the Sam’s Club app and have diapers delivered right to your door! Talk about convenience! The offer is valid on NEW 2x softer Pampers Swaddlers with Heart Quilts and NEW best-fitting Pampers Cruisers with 3-way fit. Oh joy, the stage of dirty hands and sticking all the things in the mouth. This stage can be a mix of massive crazy with the mobility your baby has now discovered and needing an extra outfit for more than just one reason. If you are traveling with your little one I would suggest to carry all the tips for the newborn stage into this stage as well. My son had a blow out while we were at a Red Sox game and I ended up taking him home in a sleep sack because I didn’t plan his outfits well enough. Find diapers that fit well and hold snug to your baby’s body. New Pampers Cruisers come with a 3-way fit to ensure your baby is covered. Size up your child’s diaper for bedtime to hold extra liquid through the night or change to an overnight diaper. Give your child a small toy to hold on to while you’re changing his/her bum so that you will minimize wiggles. Use a changing pad that comes with a friendly strap to help keep your baby safe and still while you are taking on a major diaper change. I keep my changing table in my child’s closet to save floor space, but it is also a convenient place to hang a mobile on the closet rack. This is another scary diaper time! Curiosity and tantrums is the name of the game in this period of life so having diaper mishaps are more likely. My two year old has now decided that if he is really upset he will show his defiance by taking off all of his clothes. This has led to him falling asleep half naked and waking up in the middle of the night when he pees all over himself. Thankfully he hasn’t taken it off and pooped….yet. Dress your toddler in clothes that are comfortable but hard to get into. For me this has been zipper pjs with a snap at the top for nap and bedtime. Utilize the diapering strap when your child is not wanting to have his/her bum changed can be a life saver. Explain why changing their diaper is good for them. You’d be surprised how much they understand and will have an easier time sitting still for you if you explain you can get back to playing with their toys when their bum is clean again. Stay stocked in your diaper bag, car, and stroller. I don’t know what it is about this age but my boys especially pooped a lot! Keep a change of clothes close at hand. I hope these tips were helpful to you. What prep have you made to save yourself from a scary diapering situation?